President Trump had expressed displeasure after the cost of the flights to taxpayers was reported in the media this week. WASHINGTON — Tom Price, President Trump’s embattled health and human services secretary, resigned Friday amid sharp criticism of his extensive use of taxpayer-funded charter flights, the White House said. The announcement came shortly after Trump told reporters he considered Price a “fine man” but “didn’t like the optics” and planned to make a decision by the end of the day. “I’m not happy, I can tell you that. I’m not happy,” Trump said as prepared to leave the White House en route to his private golf club in Bedminster, New Jersey. In a statement, the White House said Trump would designate Don Wright as acting secretary. Wright has been the acting assistant secretary for health and director of the Office of Disease Prevention and Health Promotion. Price submitted a four-paragraph resignation letter to the White House in which he said he regretted “that the recent events have created a distraction” from the administration’s objectives. “Success on these issues is more important than any one person,” he continued. A short time later, the HHS staff received a message from Price praising the staff as “dedicated, committed” and saying it had been “a great joy” to serve with them. Price had announced Thursday that he would reimburse the government for a fraction of the costs of his flights on charter planes in recent months. 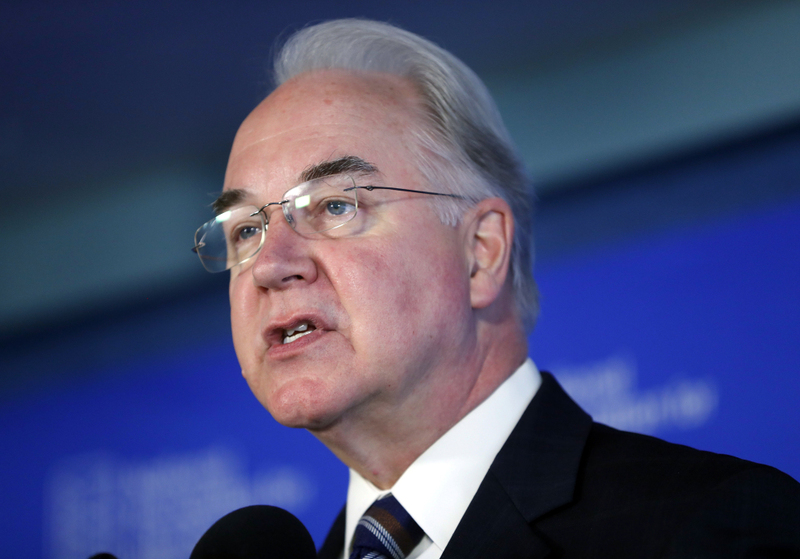 An HHS official said Price would write a check for $51,887.31, which appears to cover the cost of his seat on chartered flights but not those of his staffers. Politico, which first reported on Price’s repeated use of chartered jets, has estimated the total expense of the taxpayer-funded trips exceeded $400,000 – and it reported early Thursday evening that his White House-approved flights on military planes to Africa, Europe and Asia cost more than $500,000. The White House gave Chief of Staff John Kelly authority to sign off on government travel on government-owned, rented, leased or chartered aircraft, The Associated Press reported Friday night. White House budget director Mick Mulvaney issued the new guidance, reminding the heads of executive branch departments and agencies that they are public servants and that every penny they spend comes from taxpayers. Mulvaney told Cabinet secretaries and department heads to consider whether commercial travel would be a more appropriate use of public funds even when the guidelines allow for the use of government-owned or chartered aircraft. Besides the charter flight issue, Trump has directed some of his frustration at Price over the inability of Republicans in Congress to pass a health-care reform bill. During a speech in July to a gathering of Boy Scouts, Trump said – jokingly at the time – that Price could lose his job if a bill didn’t pass. Outside the administration, Price has been a controversial figure since his confirmation hearings nine months ago, but it was the revelation of his high-priced transportation for his travels as secretary that got him in trouble inside the White House. As the reports prompted the HHS inspector general to begin an examination of the trips, the secretary initially said that he would suspend such trips until the inquiry was complete. At his confirmation hearing in late January, the Senate Finance Committee’s senior Democrat, Sen. Ron Wyden, Ore., accused the nominee of “a conflict of interest and an abuse of position.” The main focus of such criticism involved Price’s largest stock purchase in 2016 – between $50,000 and $100,000 – in an Australian biomedical firm called Innate Immunotherapeutics. Price acknowledged that the purchase, and several smaller ones he’d made in the company the previous year, occurred without an investment broker. As part of his confirmation, he testified before members of the Senate Health, Education, Labor and Pensions Committee that he had learned of the company from a House colleague, Rep. Chris Collins, R-N.Y., an Innate board member. The 2016 investment was done through what’s known as a “private placement offering” made by a company to a select group of potential investors. Price contended that he received no insider information ahead of time. Price’s views – abhorring the Affordable Care Act and other forms of what he regards as government intrusion into health care – fit neatly within the Trump administration’s orthodoxy. But the secretary, an orthopedic surgeon before pivoting into politics, arrived at the helm of HHS holding a variety of views that deviate from the basics of federal health policy. He has been a longtime member of an alternative medical group called the Association of American Physicians and Surgeons, which opposes Medicare, the highly popular government insurance for older Americans, and offers training to doctors on how to opt out of the program. The group also opposes mandatory vaccination as “equivalent to human experimentation,” a stance contrary to requirements in every state and recommendations of major medical organizations and the federal Centers for Disease Control and Prevention. At his confirmation hearing, Price equivocated on the subject of vaccination, though he made positive statements about it later on. In public speeches in the years before he became secretary, Price deplored HHS’s Centers for Medicare and Medicaid Services – a key agency within the department he would run. The new acting secretary is trained as a physician and public health specialist focusing on family medicine and preventive care. Before arriving at HHS about a decade ago, Wright had extensive experience in occupational health. In response to the 9/11 terrorist attacks and Hurricane Katrina, he convened conferences designed to improve hospitals’ preparation for various kinds of disasters. Wright has held several senior roles at the department. During the final two years of the George W. Bush administration, he was the department’s principal deputy assistant secretary for health and, in that role, also served as the alternate U.S. delegate to the World Health Organization Executive Board. In 2012, he became the department’s deputy assistant secretary for health and director of the disease prevention and health promotion office. In February, he was named HHS’s acting assistant secretary for health.